The magnificently named Octavius Pickard-Cambridge (1828–1917) was one of the foremost arachnologists of his day, receiving correspondence and spider specimens from all over the world. He amassed a collection of an estimated 40,000 arachnids, covering all the major groups, and was a prolific author of scientific papers. Born in Bloxworth, Dorset, Pickard-Cambridge collected a wide range of spider-related materials, as well as the spiders themselves. 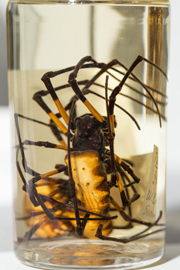 The majority of his specimens come from the United Kingdom, but there are examples of species from over 120 other countries, representing fauna from each of the continents where spiders and their allies are found. Along with the specimen collection there is also a large archive of Pickard-Cambridge’s correspondence. This archive maps out a worldwide web of contacts, showing Pickard-Cambridge as a focal point of Victorian-era arachnology. It is striking how scientists like Pickard-Cambridge were able to build global networks of correspondents at a time before the modern worldwide web, which makes communication between scientists much more rapid today. 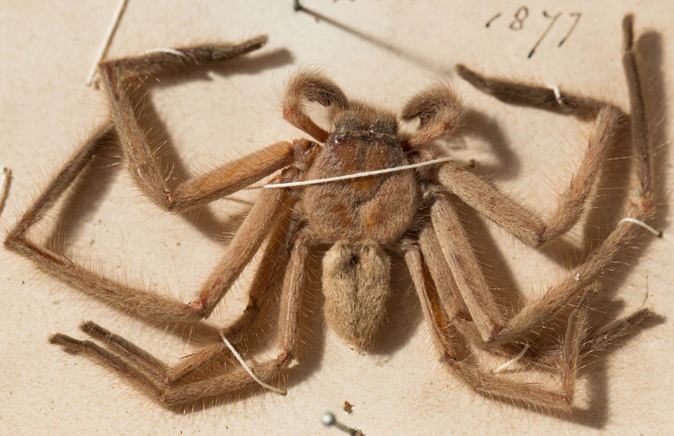 This is one of the spiders that Pickard-Cambridge collected. With over 35,000 species described from all regions of the globe, except Antarctica, spiders are diverse in both form and origin.